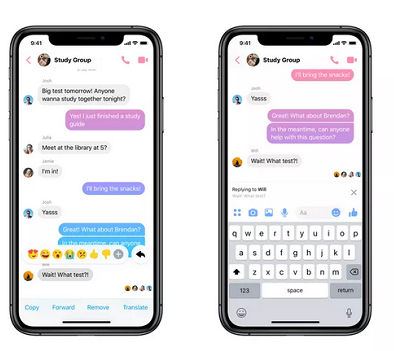 Facebook is updating Messenger today with a new feature: the ability to quote and reply to specific messages in a conversation, making it easier to keep track of things (especially in larger group chats). According to the company, this feature allows for threaded messages, allowing the users to reply specifically to one message without messing around the full message thread. To make use of the new feature, users need to long press on a message and tap the newly included reply icon. Replying from there will send the message directly. In this, the user can respond with text, videos, GIFs, images and emojis as well. This is coming just few weeks after it was rumored that the company is reportedly planning to unify its messaging apps with a goal of merging threads from WhatsApp, Instagram, and Messenger. This new feature is already available on WhatsApp messenger for a while, and now it is rolling out to Facebook users. it’s a great feature, Id love it!